One of the most delightful, special, and versatile of the green teas out there is Matcha. It is not only made from the best tea leaves (with the veins and stems removed) and carefully ground to a fine mesh (by traditional grinding stones or newer machines), it can be used in a variety of recipes. I selected three as representative of the bunches available online. What better to make as we approach the holiday season when cookies are as common as grains of sand on a beach. These will certainly delight the relatives gathered round for that special Thanksgiving feast coming soon. If you are hosting that dinner, bake a batch or two of these a few days ahead. If you will be a guest, bring a batch or two along with you. The best things about these is the sugar you roll them in at the end. It makes them all sparkly and holiday-ish. And since you can cut them into any shapes, you can do some as pumpkins and turkeys, or make some for Christmas in the shape of Christmas trees or Santa heads. A nice alternative to hot cocoa and coffee for warming your innards as the days get cooler and the hours of daylight get shorter. This hot matcha latté is also chock full of matcha goodness. And it’s easy to make. Pour 3/4 cup of milk (or if you’re lactose intolerant, use the substitute of your choice) into a small saucepan. Bring to a simmer over medium-high heat. Boil 1/4 cup of water. 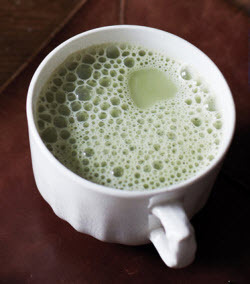 Add 1 teaspoon of matcha powder into a mug and slowly whisk in first the water and then the milk or substitute. Sweeten with sugar, agave syrup, or other sweetener of your choice. TIP: If you want more foam, tip the cup slightly while whisking. 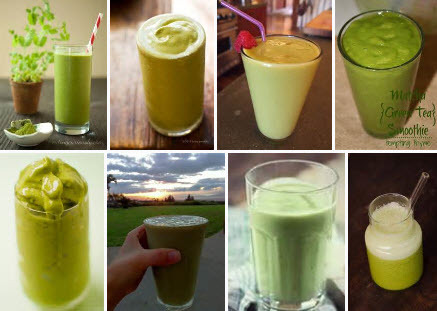 For those of you living in warmer climes, don’t forget the smoothie. And matcha makes it even better. It’s also so simple to make that you can whip one up to enjoy while preparing that holiday feast. Get out the blender. Add 1 cup ice cubes, 1 cup orange juice, 1 ripe banana, and about 1/2 teaspoon matcha green tea powder. Blend on medium until smooth. TIP: When you are near the end of having everything blended, switch to high for a final bit of frothing. Whichever you choose, be sure to use a high-grade matcha. And make enough to share!